Jerusalem Sage | Delightful in the Garden, Delicious in the Kitchen! 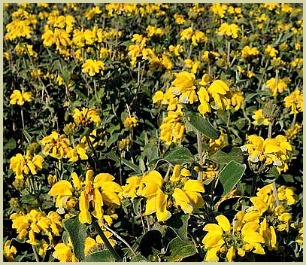 Jerusalem Sage - Delightful in Your Garden, Delicious in Your Home Cooking! Growing wild in the hills all around the Mediterranean, the pretty herb known as Jerusalem sage is a wonderful variety of one of the world’s most popular herbs. It is native to areas from Greece to Israel, but today people around the world grow phlomis fruticosa, enjoying both its delights in the garden and in the kitchen. It is popular as it's both hardy and uncomplicated. Jerusalem sage grows as a shrub, with its silvery, spiky leaves growing up to four inches in length. It offers pretty yellow flowers, which are tubular in shape and they grow in a coil of about 20 flowers, creating a lovely display. The shrub can grow up to four feet in height, and offers a nice aroma in the garden which comes from the leaves. Read more about the plant. It is highly drought-resistant, and stays evergreen even when dormant. In colder climates, it may die back entirely but it will be back again when warm, spring weather reappears. This is also a wonderful plant for cuttings, if you want to share with friends or use in the kitchen. If you're interested in growing from seeds, click here for tips. When you generally buy this herb for cooking, you’re most likely picking up common sage. However, if you have a nice supply in your garden, there’s no need to buy anything different. Where it grows wild along the shores of the Mediterranean, people use this Jerusalem type as a perfectly acceptable substitute. Use the plant’s leaves either fresh or dried. Chop finely and use sparingly as sage can have a strong flavour. Sage is a delicious compliment to meats and root vegetables, and, of course, it is the herb that gives turkey or chicken stuffing its homey and welcoming taste and aroma. Mexican Sage - Very Pretty and Butterflies Love it!